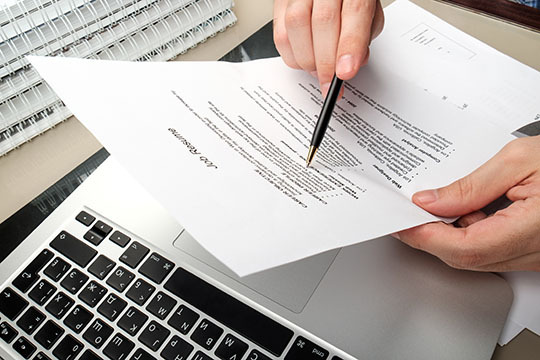 Your CV is your initial introduction to a potential employer. It is a marketing tool to advertise your skills and experience. It sells your qualifications, skills and achievements to a potential employer and informs them of your employment history. Relevant to the position for which you are applying. Name, address, contact details. There is no obligation to put in details such as marital status, date of birth although you can if you wish. A brief description of you in 4-5 lines. Start with a personal bio that reflects you and what you have to offer. It should showcase your relevant experience & competencies. It should be told in your voice and should not use industry jargon. This is a good opportunity to capture the reader’s attention and encourage them to keep reading your CV. Feature your company, your role title and the exact period of time you worked there. We recommend you highlight your top three to four areas of responsibility in your past positions and then highlight beneath them your key achievements in each position. Give more weight to your recent experience & achievements. Separating out your achievements will help them stand out to the reader, who may have to read numerous CVs to determine a short list. Your achievements should be very commercial, very results-oriented. How did you make a difference? Achievements should be factual, measurable and quantifiable. Demonstrate how you drove market share, sales volume or value, profit. Bring out what you owned in your role, what you were responsible for and where you added value. It can be useful to provide top line information on your company, without divulging confidential information. Your CV should demonstrate career progression where possible. Start with your most recent qualification first. Again, keep it succinct and there is no need to include your Leaving Cert results! You should include relevant skills gained throughout your career including company training courses etc. This is the part of your CV where you can give potential employers an indication of who you are. Keep these succinct and ideally relevant, showing skills required for the particular role e.g. Teamwork, by showing you play sport for a local club. You are not required to include details of references, however you should make note at the bottom of your CV that references are available upon request. You should have at least two referees on standby should they need to be contacted. You should be confident that the individuals you have selected will give you a relevant reference, so ask them what they would say and use the opportunity to address any concerns they might have. You should ensure your referees are as recent as possible.